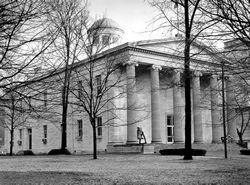 The earliest building designers of Kentucky were not professionally trained architects but were amateur builder-architects or builder-designers. Most of the builders were house joiners, carpenters, and bricklayers who conveyed the traditions of their immediate environment. By the late 1700s, Matthew Kennedy came to Kentucky from Virginia and Mathias Shryock came from Maryland, bringing with them traditional building skills from their home regions. In addition to their traditional building methods, these builder-designers relied on regional materials. Stone was the predominant building material because of the availability of limestone and marble, a metamorphosed limestone. Stone was used in the foundations of early log cabins and for simple and complex building forms because it was durable, flexible, and could be used for architectural ornamentation. Kentucky clay provided a good quality of brick that could be fired into a hard brick. John Bob's was a local brickyard in Lexington in 1791. Three distinct architectural styles emerged in Kentucky in the first half of the 19th century. Gradually replacing the Federal style during the first quarter of the 19th century, Greek Revival becomes the new national style, ever present on public buildings such as churches, schools, and government buildings. Religious buildings became the prime examples of the Gothic Revival style by 1830, supported by clergymen as economical to build and excellent examples of ecclesiastical architecture reaching to the heavens. Gothic Revival was also an exuberant, romantic design that promoted country living and connecting to the land through landscaping and horticulture. While the Renaissance Revival style was beginning in upstate New York by the 1840s, local builders chose the less formalized Italian villa style (Italianate) that related to the agrarian lifestyle of Kentucky. Architecture was not recognized as a profession in America until the construction began for the U. S. Capitol. Benjamin Henry Latrobe introduced the Greek Revival style for public buildings to America. English born and trained by an English architect, Latrobe is often credited as the real founder of the architectural profession in the United States. While Latrobe was engaged in the construction of the U. S. Capitol, he became acquainted with U. S. Senator John Pope. In 1810, Pope commissioned Latrobe to design his suburban villa at Lexington. Three sheets of drawings for the house filed with the Library of Congress reveal that two- and three-story elevations were proposed for the elegant house. The two-story elevation was chosen by Senator Pope and built by Asa Wilgus. Latrobe was also a friend of Henry Clay when he was Speaker of the U. S. House of Representatives from 1811-1820. Latrobe offered free drawings to Clay for construction of the main building at Transylvania University but his plans were not chosen due to expense or difficulty in execution. Clay did ask Latrobe to design the wings and additions to his residence, Ashland, which Latrobe completed before his death in 1820. The influence of Latrobe is evident in his buildings and successors: two of his best students were William Strickland and Robert Mills. Gideon Shryock, one of Mathias Shryock's 11 children born in Kentucky, was educated in Lexington and apprenticed with his father. When he was 21, he went to Philadelphia to study under William Strickland who was designing the second Bank of Philadelphia, patterned after the Parthenon. Shryock also purchased a copy of the American edition of Swan's British Architect that he brought back to Lexington. When he returned, he submitted plans for the third state house in Frankfort that were accepted. The building is constructed with a hexastyle portico of polished marble taken from local quarries on the banks of the Kentucky River near Frankfort. Not only is the building as nearly fireproof as possible, but the stairway is also an engineering feat. Gideon also received a commission for Morrison College of Transylvania University to replace the main building that was lost to fire. His plans were amendments to an earlier plan, creating a porticoed central pavilion and wings. This set the precedent for simplicity in the Greek Revival movement in Kentucky. Shryock was the State's most prominent architect from 1827 to 1837, designing public and residential buildings in Frankfort and Louisville. One of Gideon Shryock's apprentices was John McMurtry (1812-1890), also from Maryland parents but who was born on a farm outside Lexington. McMurtry was a builder who sought the training and guidance of Shryock in 1833 and within a year, Shryock decided to let McMurtry sublet a building contract for the new dormitory at Morrison College. 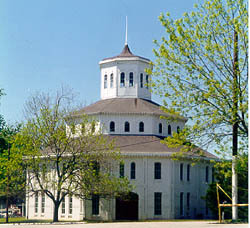 McMurtry and his brother completed the carpentry work and his building career began. 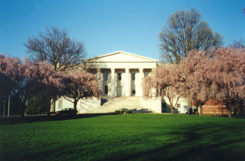 McMurtry designed and built many public buildings in the Greek Revival Style in Lexington, such as The Medical Hall and dormitory at Transylvania University. McMurtry combined Greek Revival with Gothic on the Catholic Church of Saint Peter (1837) that stood on North Limestone before it was demolished in 1930. This combination of Greek Revival with pointed windows and doors and Gothic spire was unusual, but shows that English influences, such as the Gothic Revival, were on their way to Kentucky. McMurtry was the builder for Major Thomas Lewinski's design for Christ Church in 1848 and the architect for the McChord Presbyterian Church on Market Street, which contained the first stained glass windows directly imported from Germany. By 1831 a national interest in open space and parkland emerged from the first rural cemetery, Mt. Auburn Cemetery in Cambridge, Massachusetts. The cemetery was no longer a somber graveyard, but instead was a place for reflection, strolling, and family picnics, with the intent to improve the health of urban residents. The setting favored an English park with monumental architecture. John McMurtry designed two Gothic Revival gateways for the Paris Cemetery Company and the Lexington Cemetery (torn down in 1890). An outstanding example of one of McMurtry's Gothic Revival residences is still visible today in Elley Villa, built on Maxwell Street. The construction is an adaptation of design 25 in Andrew Downing's The Architecture of Country Houses. The house has changed uses now and is known as Aylesford, a private residence. Another excellent example is Loudoun, designed by A. J. Davis (New York architect), and called by Clay Lancaster, "the first and foremost castellated villa in Kentucky." Built by John McMurtry, the villa is now Castlewood Park. Thomas Lewinski arrived in Lexington in 1842 about the time Gideon Shryock was moving to Louisville. Lewinski was English born and trained as a Roman Catholic priest, served as a soldier in the British Army and taught at the University of Louisville. 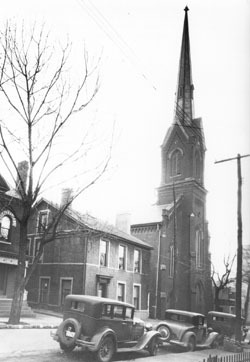 In 1848 Lewinski designed Christ Episcopal Church, the fourth Episcopal Church to occupy the site. Major Thomas Lewinski was the architect, John McMurtry was the builder. When Henry Clay died in 1852, his son purchased Ashland from the estate. Apparently damaged by the 1811-12 earthquakes, the foundation was badly damaged and Clay decided to rebuild Ashland. Lewinski was hired to design the new Ashland which follows the basic design of the original but with more elaborate detailing. Ashland was completed in 1856 and is now open to the public through the Henry Clay Memorial Foundation. Cincinnatus Shryock, younger brother of Gideon, studied medicine at Transylvania University until the final term when he left school to work on a construction project. Apparently somewhat of a renaissance man, Cincinnatus was a mathematician who designed his own telescope, was an avid reader, musician, and builder who embraced the Gothic Revival style. 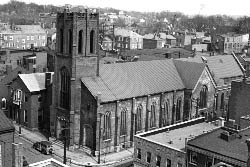 In 1872 he built the First Presbyterian Church on North Mill Street with a 150-foot spire. His work is evident in the South Hill Historic District.